With an experienced company, hoarding cleaning will run smoothly and efficiently. Hoarding cleanup not only means rubbish clean up; but also the recovery of all the items in the home that are still useful, valuable and sentimental. Accidents and injuries in the workplace often leave blood and body fluids behind. Blood and body fluids can carry infectious diseases and the dangerous pathogens that spread them. We provide the safe and effective clean up of blood and Faecal matter. Whether it be human or animal, our team will undertake the most effective way to remove the bio hazardous waste and all odour. 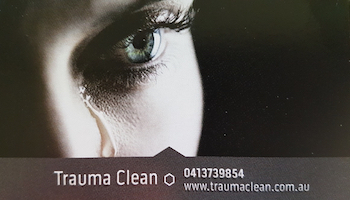 1With over 18 years experience in the Trauma Cleaning business, TRAUMA CLEAN has provided the Australian people with a professional and discreet service in all situations. Trauma Clean offers flexible and discreet scheduling to meet clients needs, and all work is completed in a timely manner to allow reoccupation of the premises at the earliest possible opportunity.